Like too many others, Adam Britton went to war a confident young man and returned damaged, both physically and mentally. Doctors and time try their best, but cannot cure what ails him. What does help? What form of therapy works best for him? Four-wheeling. Off-road adventures that take him to remote places and provide challenges. He’s found it to be so beneficial that he wants to take others with disabilities along for the ride. The 43-year-old Denair resident and Army veteran joined the Army National Guard as an emancipated minor in 1987. He later re-upped with the regular Army and became an air assault infantryman. Sent to Arizona in 2001, he spent 17 months doing anti-drug and anti-terrorism duty. He volunteered for duty in Iraq in 2004, and went to a base south of Baghdad. He suffered wounds and injuries in three incidents in a little more than four months. He tore the meniscus in his right knee when boxes of ammo and grenades slammed into his leg during a vehicle accident one night. Then, as he rode atop a Humvee as the driver’s side gunner, an insurgent’s vehicle rammed his head-on. He went flying, landing on his shoulder and separating it and causing nerve damage in his right arm. And finally, while recuperating, he went into a post exchange, bought a couple of items and then headed for the door. Just as he stepped outside, an enemy mortar struck the building. The concussion of the explosion left him with a brain injury, a smashed nose, a sliced hand, chipped teeth and more nerve damage. Hence, a flight to Germany and the first of many surgeries. Two years later, he received a medical discharge. And in the decade since he was wounded, he’s had numerous surgeries and seemingly endless rehabilitation. He uses a cane to walk, and while he has good range of motion in his right hand, he has no feeling in it. Veterans Affairs rates his disability at 100 percent, he said. He has post-traumatic stress disorder, which also factors in. 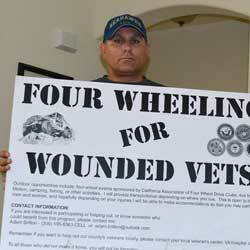 Such frustrations can take these vets into dark places emotionally, he’ll tell you. Often, he hunkered down at home, an angry and withdrawn man. “I spent three years not leaving home,” he said. But he eventually began doing more, and came to realize the impacts his condition had on his family and himself. “No matter what a soldier goes through, it’s always harder on the spouse,” he said. He knew things had to change, and he had to change them. To do that, he needed a purpose and a cause that could help him by helping others. He found it on four wheels. Britton bought a Jeep Rubicon in May 2013, and found the four-wheeling trips to be therapeutic. He concluded other veterans could benefit, too, so he decided he would take some along. “My goal is to create an atmosphere where veterans can enjoy themselves and share camaraderie and friendships with other veterans going through the same things,” he posted. Four-wheeling, he said, is good for the mind and the soul, a way for physically and emotionally wounded veterans to relax and unwind. “I hope that by spending the day enjoying the outdoors, that for at least this short period of time, we can forget the hell of yesterday and enjoy today,” he said. Britton’s trips employ a concept similar to that of Rivers of Recovery, a nationwide nonprofit with a Modesto chapter that raises money to take veterans on fly-fishing trips to places such as Utah, Montana and Wyoming. The difference is that Britton doesn’t intend to create a nonprofit organization. In fact, he asks for no financial contributions – only participation. He said he’s working with four-wheel-drive clubs to coordinate some events. The trips generally are day excursions, though they can include fishing, camping and other outdoor activities. Britton doesn’t profess to be a counselor – just someone who has been there, like so many others who went to war and are back home trying to work through the physical and emotional damage. He’s got plenty of company, and room in his Jeep. Get all the latest news from the MPOA delivered right to your inbox. Subscribe to the MPOA mailing list with just a click!